“Being fat isn’t your fault; staying fat is.” That’s what Jackie Warner, America’s favorite no-nonsense celebrity fitness trainer tells her own clients, and that’s why no one delivers better results than Jackie does. Now for the first time, Jackie shares her revolutionary program, showing readers the best ways to drop pounds and inches fast, without grueling workouts or deprivation, and keep them off for good! Her two-tiered approach provides a complete nutritional makeover and a failure-proof condensed workout routine PLUS all the emotional support and encouragement you need to get to the finish line and beyond. This is Why You’re Fat (and How to Get Thin Forever) is bursting with information that is both different and not overwhelming. 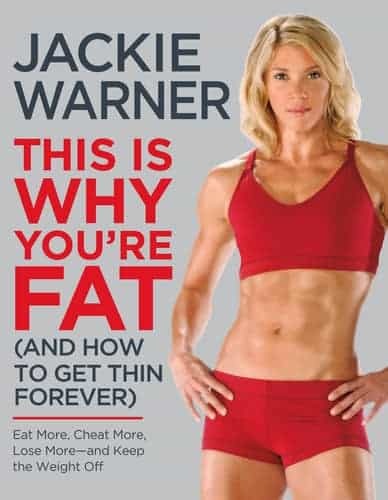 Of course, I like the idea that Jackie Warner tells us that part of the problem with weight is hormone balance. One of those hormones, though, HGH, can be improved by not eating carbs for dinner. Well, heck, if I could not eat potatoes, pasta, rice, or bread for dinner, I wouldn’t be having so much trouble. Warner also explains the functions of hormones like estrogen, insulin, and progesterone, as well as how our bodies react to imbalance of these hormones. This is all introduced in the first chapter. Then there’s chapter 2. Sugar. I would like to get off sugar, and, after reading this, I feel like I have the information, the tools, and the motivation I need to do so. There are also the Organ Destroyers — stuff like alcohol, excessive dairy products, junk food, and tobacco. But Warner says items like acetaminophen, prescription medications, and caffeine also wreak havoc on your liver. Not so easy now, I thought, but kept reading. She then moves on to the two-week jump start, which, believe it or not, is not one of those insane, starve-yourself-to-death-on-1,000-calories-a-day-while-eating-things-you-don’t-like-and-have-never-eaten-before regimen that will put you on the verge of a mental meltdown. (Can you tell I’ve tried these things before?) For the first 14 days, you add — let me repeat, add — two eggs, a cup of plain oatmeal, 2-3 cups of vegetables, two fruits, 2-3 liters of water with lemon juice, a whey protein shake, and herbal teas to your diet. Wow, right? I also like — no, I love — that she subscribes to a 5+2 plan, which entails eating healthy foods for 5 days and then eating two favorite meals (which can be up to 1,500 calories each) on the weekend. How great is that? Love your wine? Incorporate it into one of your favorite meals. You get the idea. Warner isn’t telling you that you have to cut out the things you enjoy forever. The beauty of her plan is that your body will change and you won’t crave these things that are bad for usâ€¦but for those foods that we can’t live without — we don’t have to! This book has just the right voice; it’s intelligent, but isn’t written in complicated, scientific terms. But it’s not dumbed-down, either. This is a do-able plan. And, from the sounds of it, it’s one we should at least try, for the sake of our health and our body. I will be! Wow! to add food instead of taking it away-sounds really good to me. This book would definitely help me with my weight loss plan. I need something to jump start my weight loss. So far it isn’t going so well. I have your new button. This is a great prize! Enter me please. I could really use this book. I need help. I’m excited about this one! Cool book! I really could use this book!